A great skin care routine benefits from the addition of a weekly face mask. Masques offer visible results that every day products simply can’t do alone. A high quality, organic clay mask is going to give your skin an instant glow with exponential long term improvement in just 20 minutes. An organic clay mask, like Masque Supérieure is designed to not only detoxify and revitalize, but also infuse nourishing extracts that sooth, soften and improve the skin with time. Essential to the very fabric of life, minerals are necessary for all of the biochemical processes that occur in our body. Throughout ancient history, humans have been using mineral clays to sooth, detox and heal for optimal health. It’s no wonder we still see the best results when using these revitalizing organic ingredients from the land and sea. An easily attainable substance, clays are rich in many essential minerals necessary for healthy, beautiful skin. Masque Supérieure utilizes not one, but two different types of high quality clays to give skin a variety of healing benefits. Ideal for cleansing and softening, Red clay contains a wealth of essential trace elements and minerals. It’s rich in iron oxide, a safe and nontoxic mineral, which gives it its distinctive red hue. Red clay’s high alkalinity allows it to absorb and draw toxins from the pores. When used as a face mask, it softens the skin and leaves it looking radiate while balancing skin tone. The second star mineral clay to look for in an organic clay mask is White Kaolin clay. It’s mild properties and fine texture make it ideal for all skin types from babies to mature skin. When used as a face mask, its natural absorbency draws debris from the pores, purifying, cleansing and soothing them without stripping the skin of its natural oils. Although Red and White Clays provide the skin with fantastic detoxifying and cleansing benefits, Masque Superieure goes a step beyond by including revitalizing sea materials, the first of which is Sea Silt. A nutrient dense sediment found on the seafloor, Sea Silt contains minerals, purifying clays and trace elements that are easily absorbed by the skin for a deeply nourishing treatment. It’s unique blend of organic materials help to combat dryness and give the skin a desirable glow. 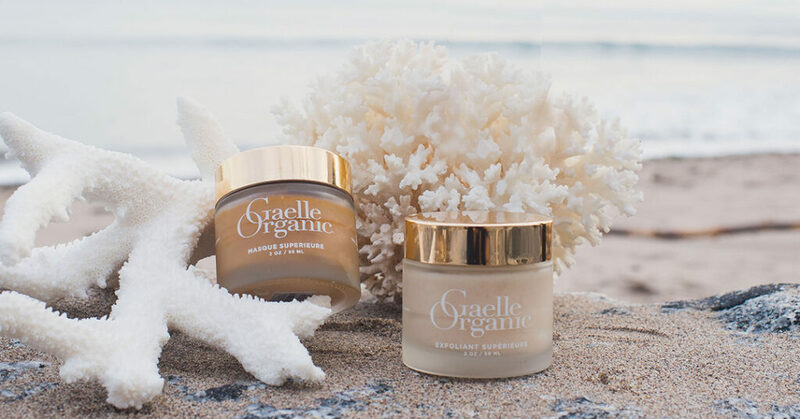 Gaelle Organic uses sea silt from Hawaii, where the waters are among the cleanest and most nutrient concentrated in the world. An ingredient you’ve probably stepped over on the shore, Bladderwrack is an iodine and polyphenol-rich seaweed found off the coasts of North America and Europe. The Bladderwrack extract used by Gaelle Organic is a certified-organic product that is extracted using a proprietary process. This yields a clinically-validated brightening ingredient which significantly increases radiance and reduces spot pigmentation. It also provides powerful antioxidant activity to combat free radical damage for anti-aging benefit. Chondrus crispus—commonly called Irish moss or carrageen moss —is a species of red algae which grows abundantly along the rocky parts of the Atlantic coasts of Europe and North America. It is used in skincare for its antioxidant activity, which confers anti-aging benefits by protecting skin from the appearance of aging and fine lines due to sun and other free radical damage, and for its ability to hold moisture, which can help support proper hydration and improve skin softness. Combined with the healing elements and materials found in the ocean, as well as six moisturizing and anti-aging botanical extracts, the Masque Supérieure is a step above the rest. If you’re looking for an organic clay mask that gives you that vacation glow in a jar, it’s the ideal mask to add to your weekly routine. But why stop there? Our Exfoliant and Masque are two remarkable products that can be used as often as needed on their own, but their benefits are complimented and amplified when used together. To take your skin’s natural radiance to the next level, the Gaelle Organic signature sea revitalization treatment restores luster, moisture and plumps up fine lines in just two easy steps. Simply apply the Exfoliant Supérieure to cleansed skin with damp fingertips in gentle circular motions and leave on for 10-20 minutes. You can go about your normal activities or steam in a bath or shower to aid the Breton sea salt and willowbark extract in deeply cleansing the pores as it removes dead skin cells. The willowbark contains a natural ß-hydroxy acid (BHA), providing a gentle, safe peel. Rinse with lukewarm water and follow with a generous layer of Masque Supérieure for 20-30 minutes to achieve a plump, silky smooth complexion. With hydrating emollients, rejuvenating sea minerals and soothing botanical extracts, it’s one of the easiest Multitasking routines for beautifully luminous skin that continues to improve with time.